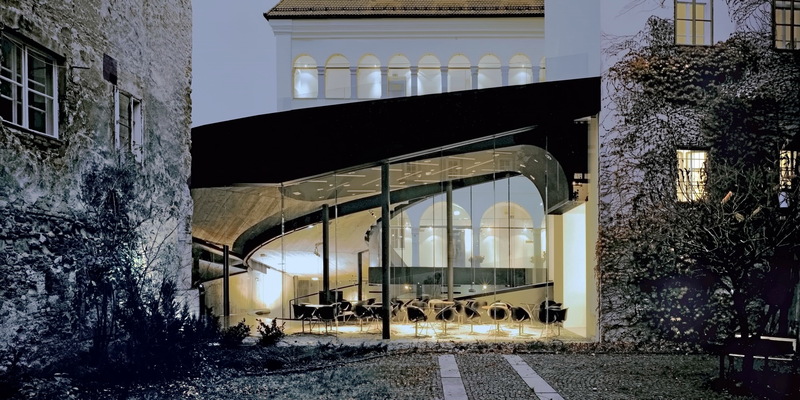 The project involved the renovation and extension of the Auersperg Palace, which is located in the heart of the protected historical city centre. 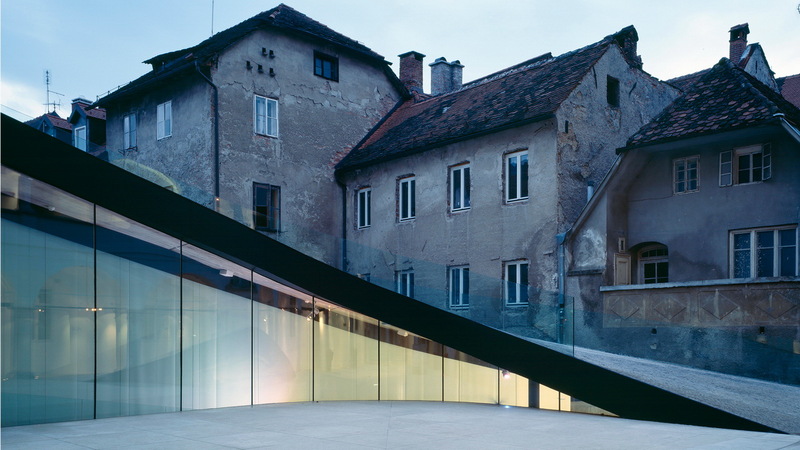 The Auersperg palace is among the most important remnants of pre-baroque architecture in Ljubljana. For the experts it is also interesting because it stands on an interesting and protected archaeological site. 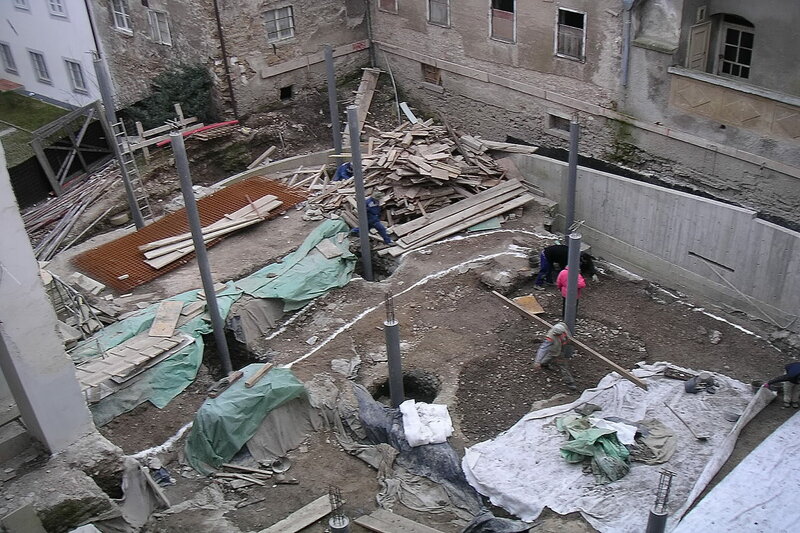 While preparing to renovate the palace large-scale archaeological research was conducted here. The palace and the plot have a very rich history dating from the prehistoric period to Roman and medieval times. Each era added something to the building. 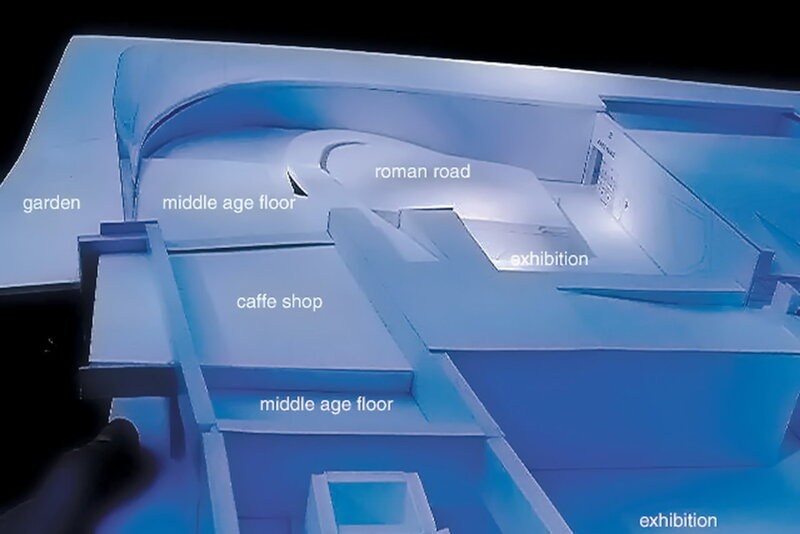 During the course of history the purpose of the palace changed several times, such that the existing organization of the floor plan was not suitable for hosting a museum program. The spaces were labyrinthine and disconnected. The palace was in a very poor state when the competition was set; it was almost at breaking point. In the previous years it had housed a library, archives and a small museum. The weight of these programs was too much for the deteriorating structure. 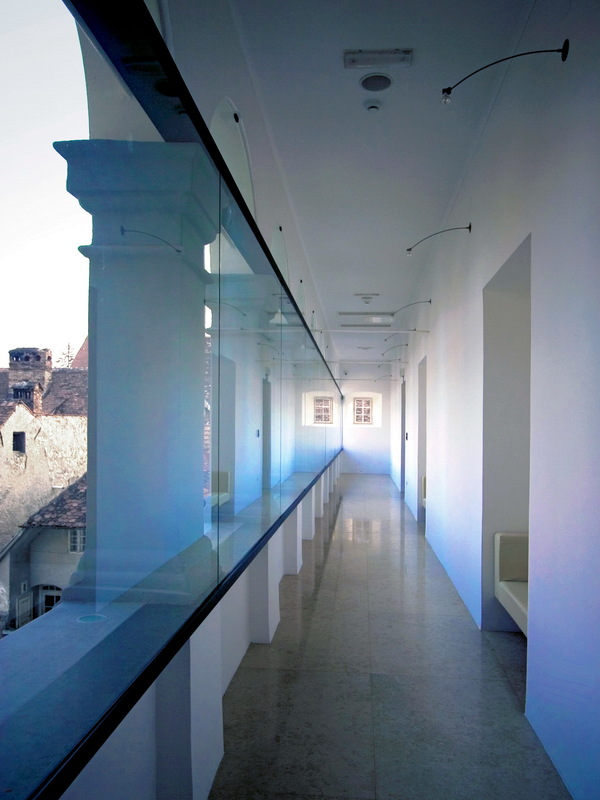 The brief of the client, which was Ljubljana City, was to make a city museum inside the entire building and to open up the archeology located under the palace and courtyard for viewing. Existing Palace: The existing palace renovation kept the character of the bourgeois medieval palace, with its connected rooms and internal stone elements such as original columns, frames, fences, staircases and wooden carvings on the windows, doors and parquet floors. 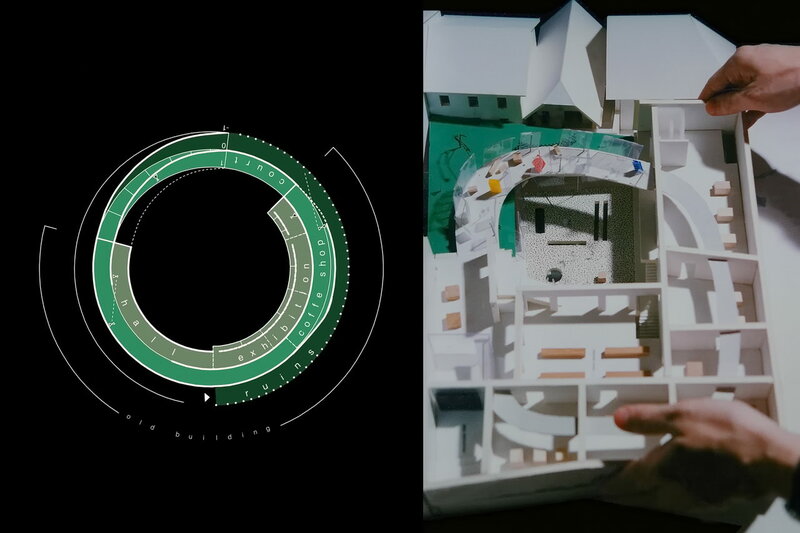 However, also inserted all installations required for a contemporary museum such as heating, humidity, fire sensors etc... Our intervention proposed a detached suspended ceiling which connects all existing rooms in the form of a spiral and also leads the visitor on a circular path around the building. The palace had a rich history that was shown in different elements dating through different eras of history. These elements had been altered over time to suit the buildings changing needs. We proposed along with the conservation specialists that these were stripped back to their original states so that visitors could enjoy the building as it was originally designed. 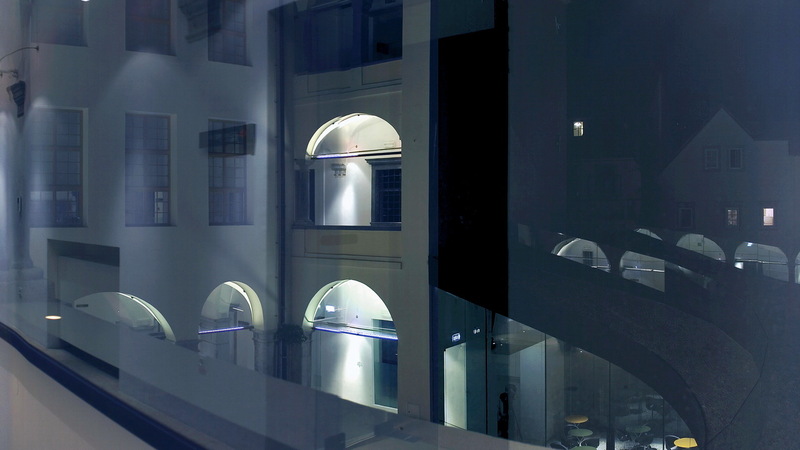 Elements that were done in recent times such as closed arcades, covered internal atriums etc were removed. 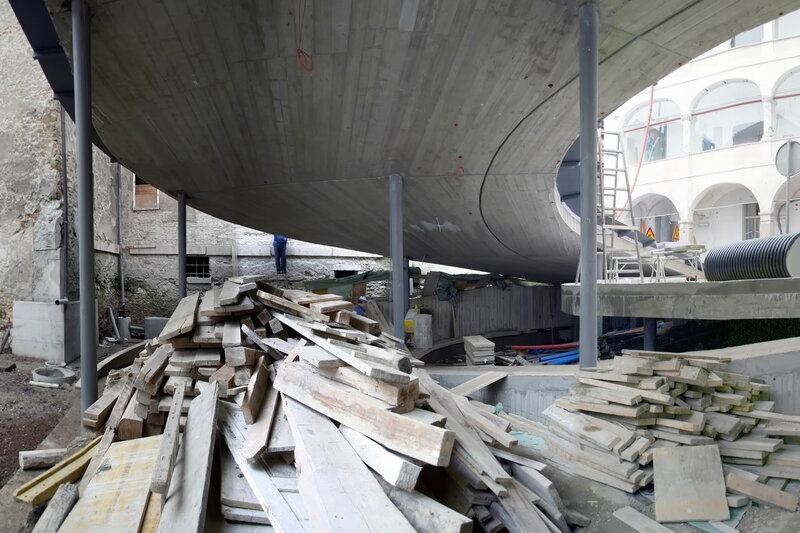 The exhibition spaces are preserved at their original size, as per the conservation program. Extension It was suspected that under the courtyard and the internal atrium there were rich archeological remains. However, before they began excavations it was not clear where they were or of what importance they would be. 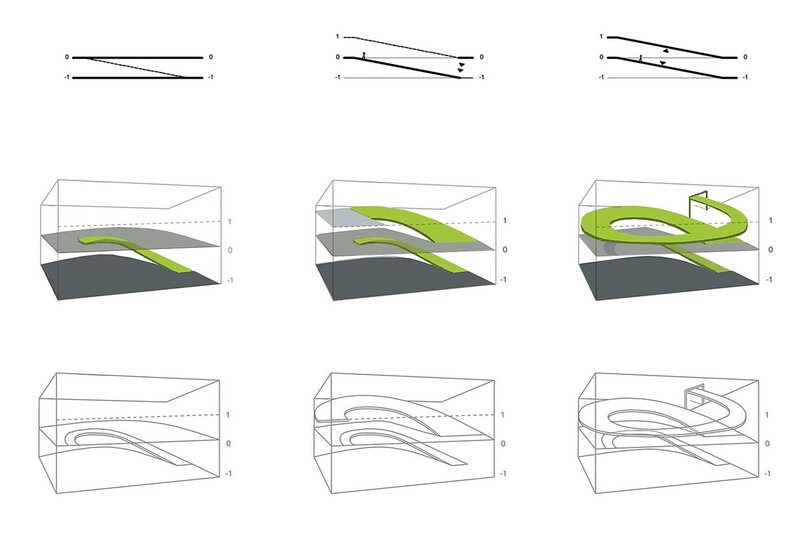 Therefore this part of the project had to be flexible and adaptable. 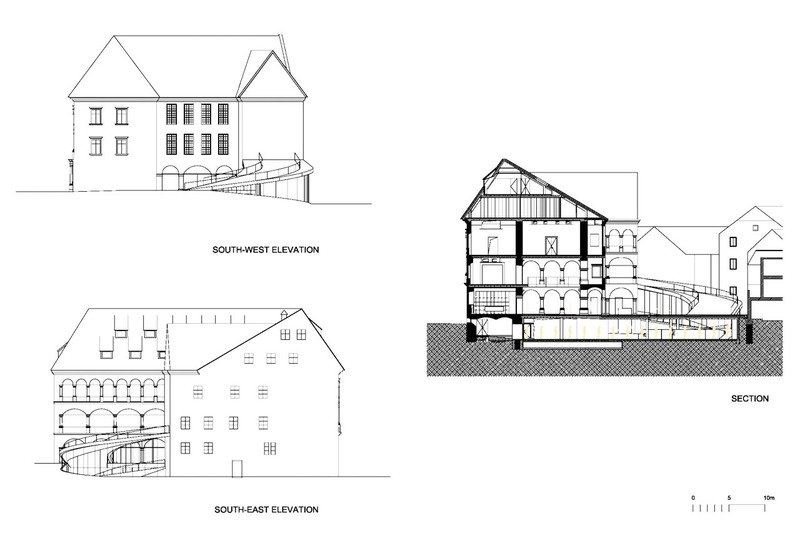 The proposed solution was an open-plan basement with an adaptable structural system. 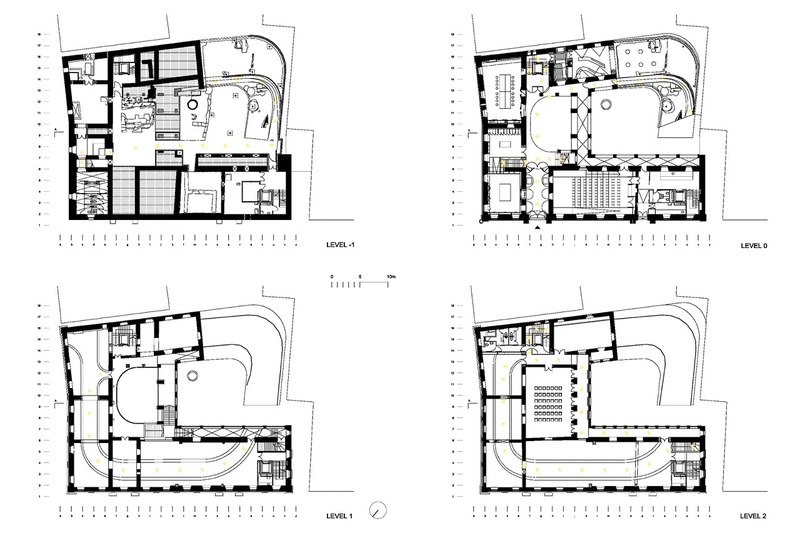 The design of the extension and the under extension was done in parallel with the archeologists excavations. Archaeologists uncovered pre-historic graves from 1000 – 800 BC, remnants of Roman buildings and one of the main roads which once connected the ancient city of Emona with other Roman cities. The road, built in the beginning of the 1st century AD was almost 8m wide. The palace thus stands on the axis of the former Roman city or rather its eastern gates and the bridge across the river Ljubljanica. The fact that the road was maintained in the early middle ages had a huge impact on the layout of the medieval city centre. The idea was to stop the excavations on the levels where quality material was found and to keep these elements IN SITU. So the cafe of the museum lays on an original medieval stone floor, a meter under this part of an original roman road is presented and under this is part of a roman building. 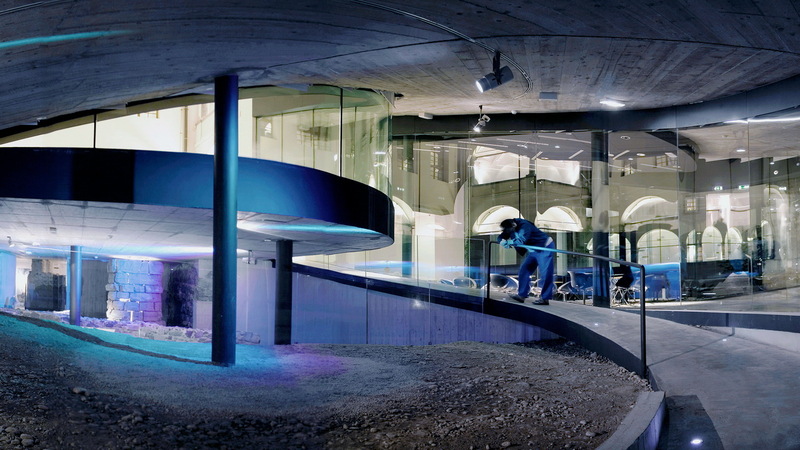 Below this still the floor of prehistoric Ljubljana is located where some graves were found. The city has evolved layer after layer throughout history so that the visitor's path begins in the prehistoric area on level -3m and then in spiral form it rises through the different ages and their original historic heights. Therefore the visitor can stand on each level. The roof also rises above in the shape of a spiral. This roof is actually the floor of the courtyard which splits and rises to also become a sort of amphitheatre. 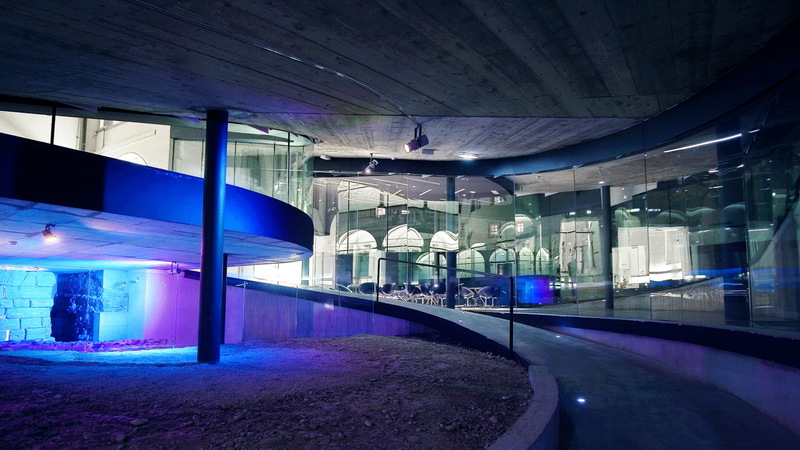 Connection between the old and new is a symbolic spiral - the circular walk of the visitor which is expressed in different forms throughout the building. The Walk of the Visitor The first spiral. 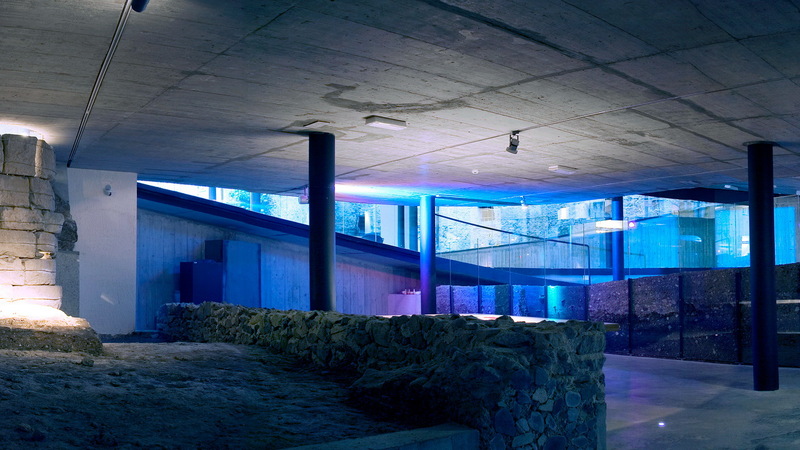 The walk starts underground at –3 m, where the ground level of Ljubljana was situated in prehistory. 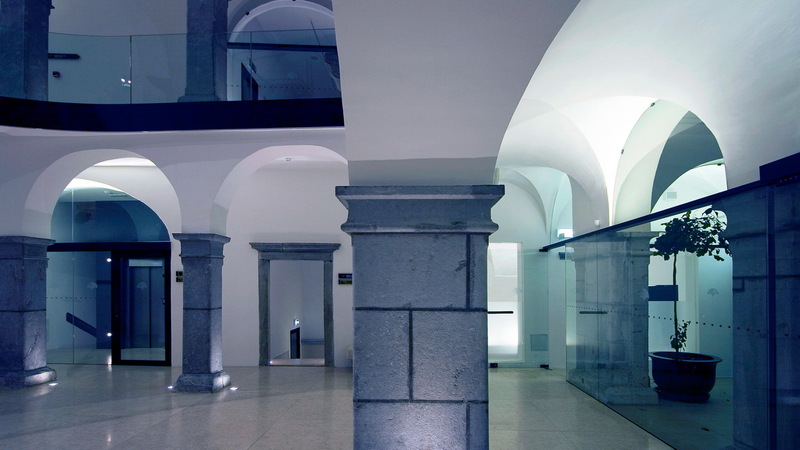 Since the city's ground level rose over the years the walkway ascends through the prehistoric level up to era of Rome, represented by an original Roman road, then medieval and baroque Ljubljana, where the museum bar is located, before returning to the ground-floor lobby. The archaeology is preserved in situ, no stone has been relocated. The courtyard floor bifurcates and raises parallel to this path and the location of the Roman road; it forms a roof above the stepped archaeology. 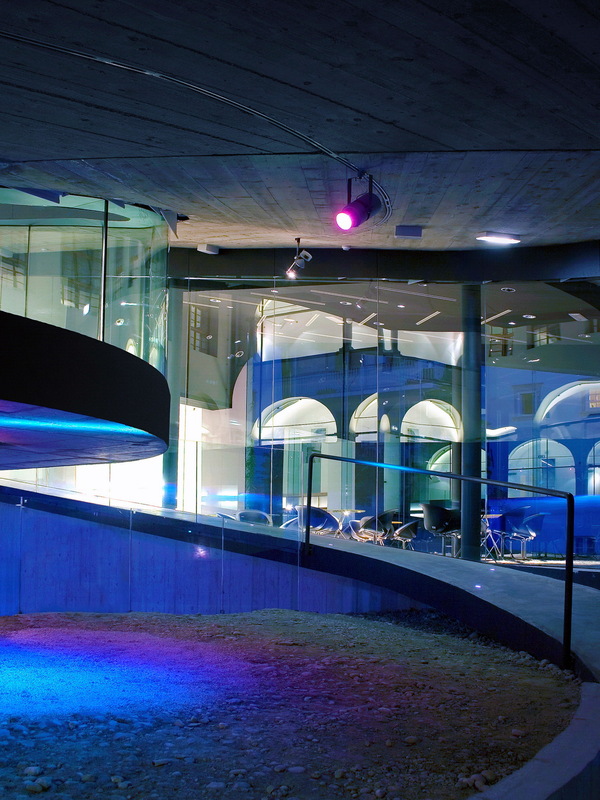 The second spiral functions as a roof over the archaeology from level –3 m to level zero, rising above the courtyard and becoming a level balcony, thus affording different views of the courtyard and the palace. The third spiral continues inside the palace on level +4 m as a balcony overlooking the main hall. Ascending up the old staircase, the spiral becomes a suspended ceiling (at +7.5 m), containing the whole service infrastructure: climate control, diffuse lighting, and the sound and fire protection system. 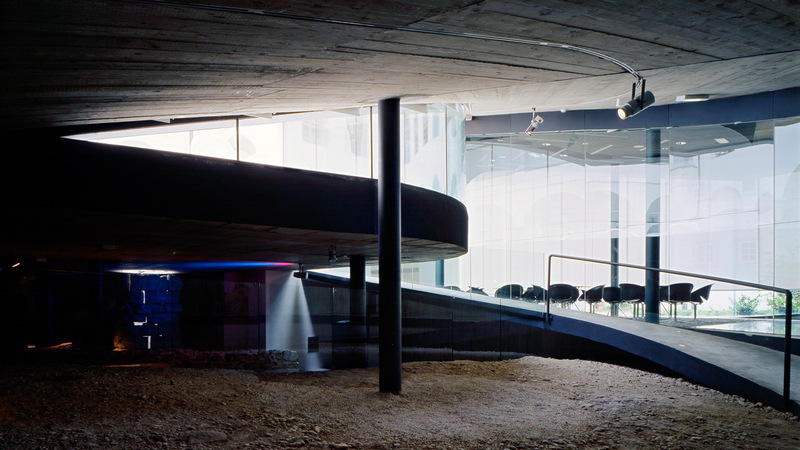 The suspended spiral continues through the rooms, taking the visitor through the exhibition. The same situation is repeated on the next floor (at +12.5 m). 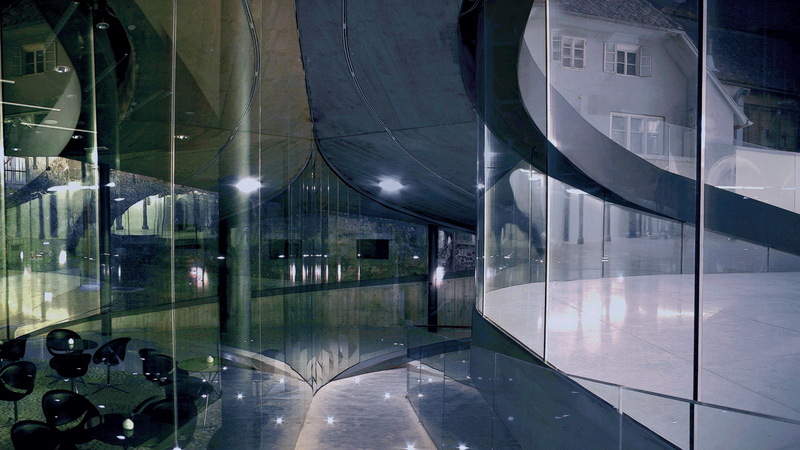 The Spiral shaped ceiling also leads the visitor through original rooms to the last floor and back to the entry foyer. The Auersperg palace stands at the southwest part of Novi trg (New Square) dating from the 14th century. 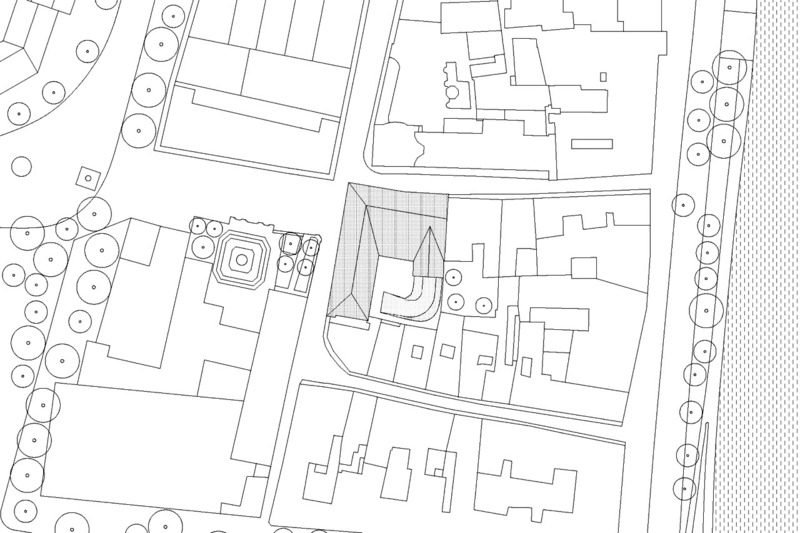 Archaeological and construction research has shown that the shaping of the floor plan of the palace was until the 17th century dictated by three older structures, which had stood on the premises before the 16th century. The first building documented in the archives and the core of the later Auersperg palace is from 1547. Baron Herbert VII von Auersperg bought the building in 1575. The two-storey corner building on the crossing of Gosposka and Salendrova streets was L-shaped and had Renaissance features. However, the house soon became too small and old-fashioned for such an important noble family. In 1650 count Janez Andrej von Auersperg decided to build a new palace. The most extensive construction work lead by Francesco Rossini, the regional architect/building contractor in Carniola, took place between 1654 and 1658. Janez Andrej decided to keep the original corner building, while other structures, including two neighboring houses were torn down and two tracts of a two-storey U –shaped palace. 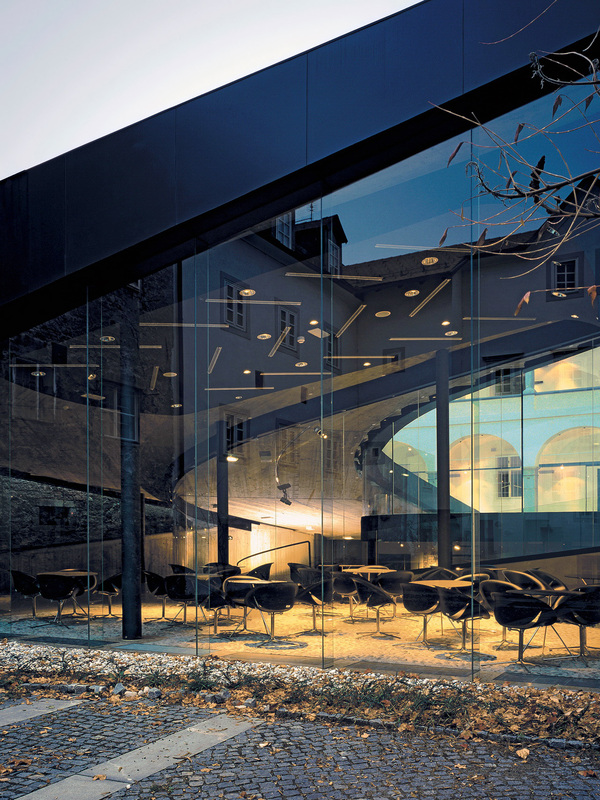 The façade of the old building was adapted to suit the new baroque fashion. 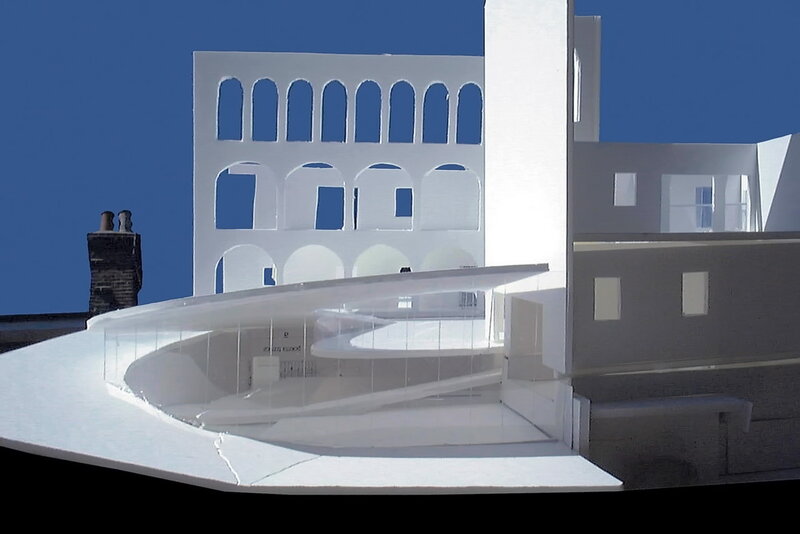 The problem of horizontal communication was solved by placing new arched corridors along the courtyard facades of all three wings of the new palace. The outer courtyard was first leveled because of different floor heights and then paved with round large paving stones. In the new palace were two spacious housing units with around 10 rooms in each storey. Soon after 1709 the new baroque parts of the palace were adapted again. On the north side of the former arcade courtyard they gradually built a new wing, a new staircase and two large halls or salons. Construction dragged on well into the twenties of the 18th century. In the spirit of the time the problem of communication was solved by building a new linking tract on the three arcaded corridors, which divided the courtyard into two parts. The last large construction took place in the 1820. The palace got new ceilings, bigger windows and a new classicist façade. The works were supervised by a Friulian master Francesco Coconi. The palace suffered degradation of interiors due to the change of its function in the 20th century (offices and flats). During these works which were partly also the result of renovation after the catastrophic earthquake of 1895, the most appalling were the deconstruction of the baroque staircase, the adaptation of the north courtyard façade, the rebuilding of hallways and both salons and the walling in of the arches. In 1935 the City commune of Ljubljana bought the Auersperg palace for the needs of its new-founded museum. In one part of the building the museum displayed its first collection in 1937. In the next couple of decades and after the war the museum shared the palace with many other institutions, such as library and archives. In this time some parts of the palace were changed with no spatial and architectural quality. Finally at the end of the last century renovating the palace became a priority due to static decay of the building. 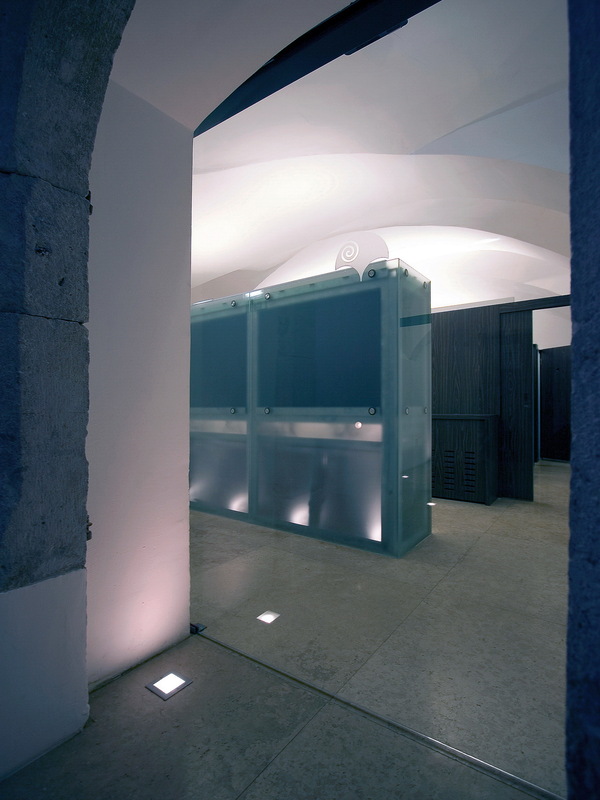 An integral static, earthquake-proof and functional renovation of the Auersperg building, the home of the city museum of Ljubljana started in 2000; concrete was injected into the structural stone walls to reinforce them, damaged wooden floor structure was replaced by reinforced concrete elements to allow earthquake stabilization and pilots were inserted under foundation to allow opening of the underground floor for archeology excavations. The goals of the renovation were to preserve the main elements of the palace and its predecessors and present them in a proper way. New architectural elements which were added due to objective necessity should emphasize the importance of the preserved architecture of former centuries. 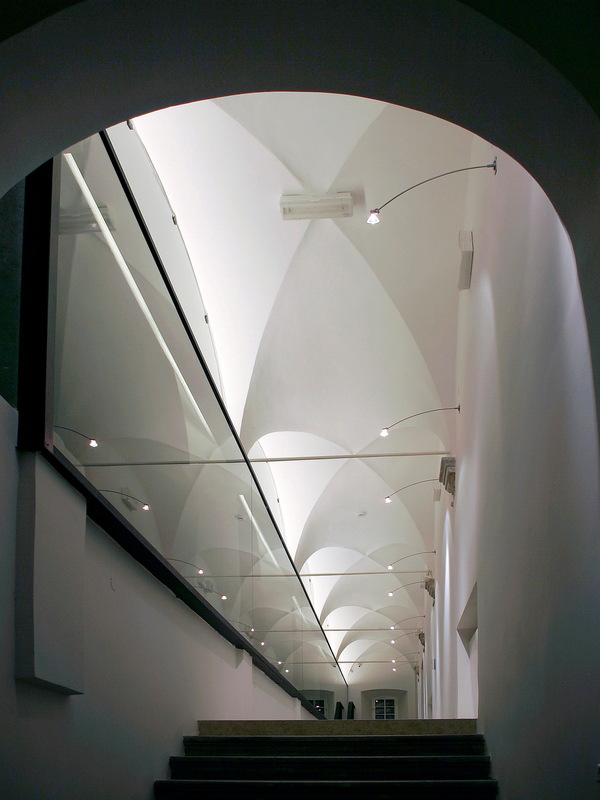 The renovated building in all aspects respects the needs of a modern museum focused on its visitors. 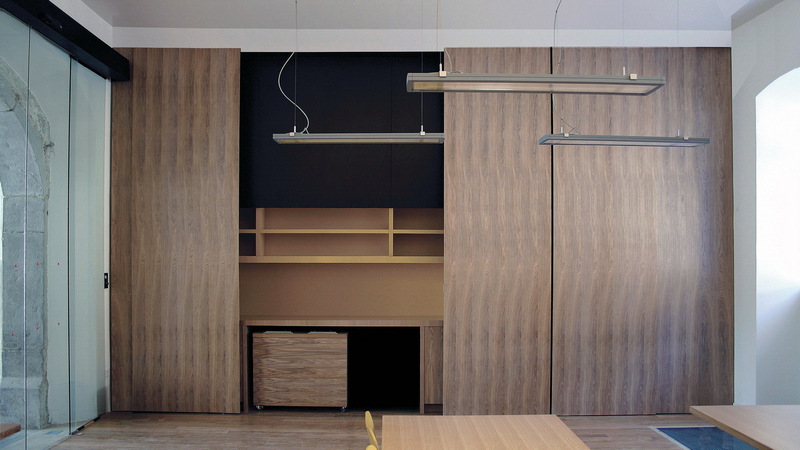 The new intervention uses minimal elements such as frameless windows and doors and neutral local materials. This allowed for a seamless integration of the new within the old and also enhanced and preserved the existing palace structures. 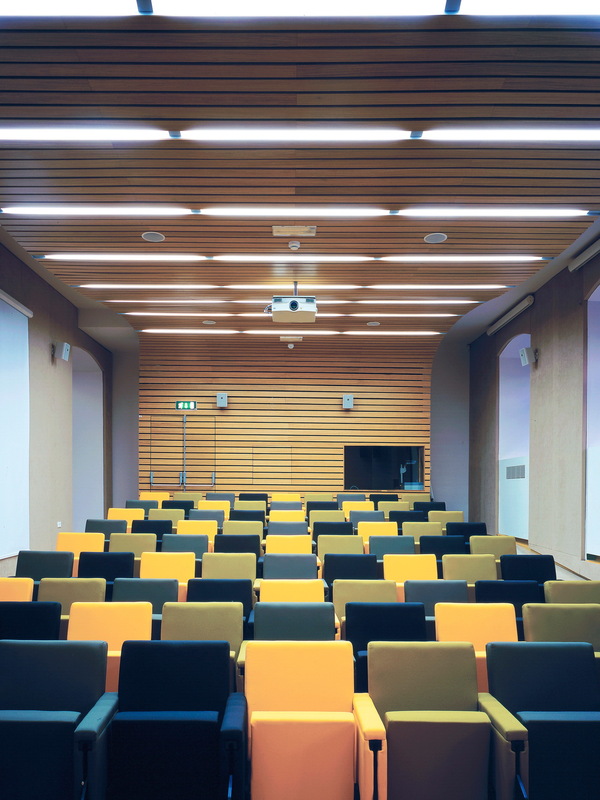 The use of minimal elements also helped to revive some of the past features of the building. Passages looking onto the courtyard would have initially been designed as outdoor areas, with the only protection from the elements being the roof. These passages were later closed up and the arched openings reduced to small windows. The competition proposal re-opened these which not only brings in more natural light but also allows the visitor to appreciate the architecture as it was originally designed. 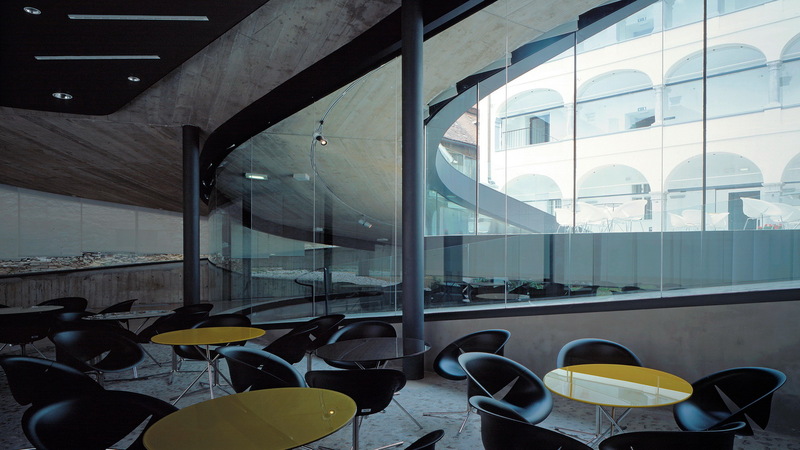 Frameless arcade glazing is attached via a small frame in between the two glass elements. Frame rests on the pillars as opposed to cutting into them so there is no lasting damage.